After another horrendous nights sleep at the Surf n Snow backpackers in Auckland we were almost relieved when our 6am alarms went – meaning it was time to shower and pack up to get our van. 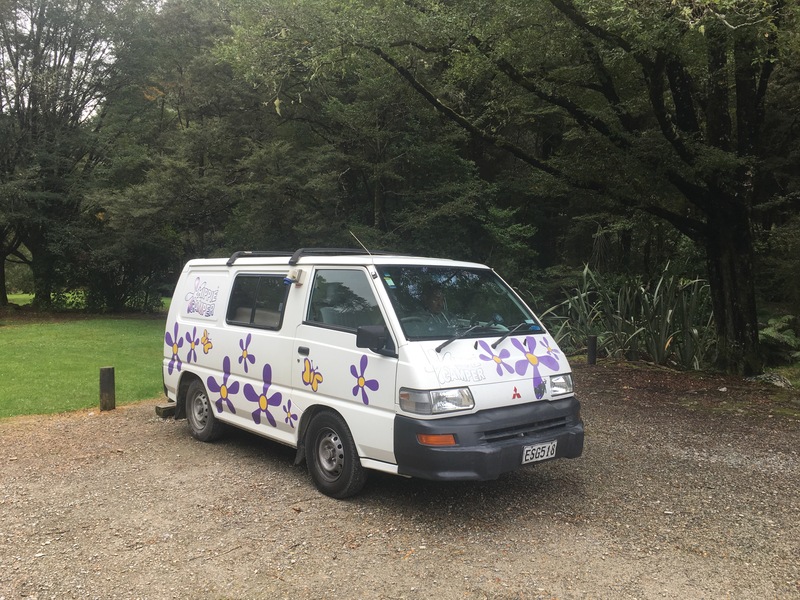 A slight error of planning meant our Hippie Campervan wasn’t for collection in town, rather at the Apollo offices out by airport – a NZD $40 Uber ride away. After some difficulties locating the rental companies office we eventually found it and joined a queue of middle aged French and Germans, all collecting their shiny new luxury campers. After what seemed like a mountain of unnecessary paperwork and a bill slightly higher than expected, we were taken outside to inspect our happy Hippie home for the next ten days. Waiting for us was a piece of crap, a rusted old early 1990s white minibus with 340,000kms on the clock, some faded butterflies painted on the outside and a cobbled together interior of a bed and kitchen from the boot. As we inspected the vehicle we did wonder to ourselves how on earth they would every tell one scratch, dent or rust patch from another. We’d opted for the cheapest option we could find, there was no doubt this would be authentic budget travelling. With all the documents signed we rolled out of the car park using the Skoot navigation system and used it to locate a Countdown store – New Zealand’s equivalent of Asda. As we were travelling of a budget we wanted to cook for ourselves every night, avoiding expensive restaurants. 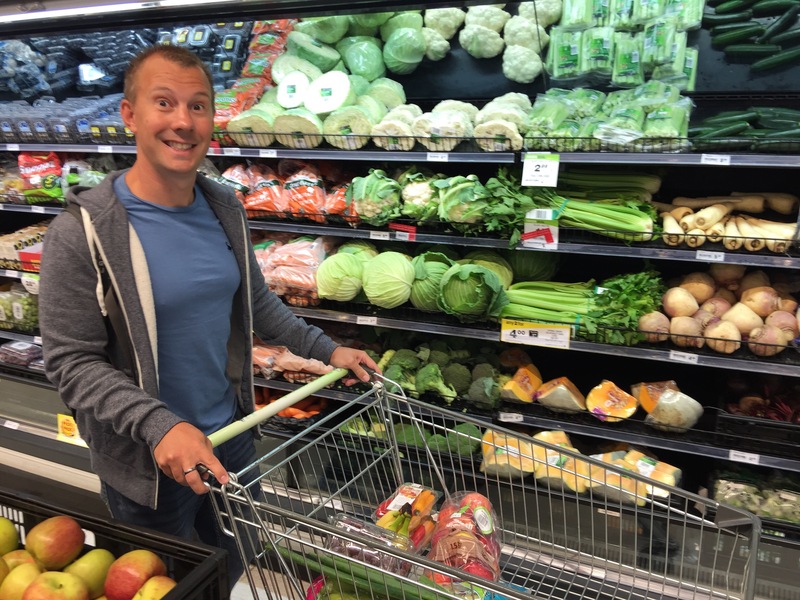 We proceeded to buy nearly $300 worth of food, including several Kgs of pasta, salads, fruit and snacks. The credit card emptied we loaded up the van and rolled out of Auckland along the main highway, headed south past Hamilton towards the small town of Waitomo just under two hours away. Our first adventure activity in New Zealand was the world famous Waitomo Glowworm Caves – for Blackwater Rafting with Kiwi Cave Rafting which cost NZD $150 per person for a 4.5hr caving experience. As we’d arrived ahead of schedule we located their office but there were no earlier departures available so we drove back into town and had a McDonalds milkshake and made use of the bathroom facilities. On our route back to town we’d also spotted a local farmstay, offering powered campervan sights for $15pp just a kilometre from the Kiwi Cave Rafting office. We booked in with the landlady and changed into our swimwear before jogging up the road to meet our team for our subterranean adventure. That was our first error, as although the instructions said bring swimming costume, socks and towel, the showers were located a 25 minute drive from the office, so warm clean clothes were essential. Our group were all friendly, our guide Laure from Taihit, three girls from France and Germany and their NZ landlady. Once all weighed and checked in, we jumped in a clapped out minibus (not dissimilar to our Hippie van) for a drive through the countryside. The first stop was at the base camp, comprising of steel shipping containers and a shower block we’re we changed into 5mm wet suits, abseiling harnesses, white Wellington boots and helmets. Once changed we jumped back into the van, all struggling to move in our kit, for a 10 min drive into farm land. We reached a clearing amongst the rolling fields and jumped out and were lead down a steep green bank to a man abseiling training point were we got a crash course in rope work. After checking we all had the basics down, we headed further down the grass slope and clipped on to safety equipment. A few steps later and the Earth gave way to a massive dark crevice. With Jamie up from he’d inadvertently volunteered to abseil down first – approximately 30m into the dark cave. Everyone watched as Jamie descended into the cave, down dark muddy rocks and landed in a fast flowing underground river. One by one we all joined him at the bottom – the abseil was relatively straightforward but for some bouncing off the rock face, the trickier part was the final metre or two and the shock of your feet submerging in ice cold water. Shock soon have way to sheer pain, the water was an excruciatingly cold 12c but we were soon knee and then waist deep in it as we eased up stream. We were each handed an inflatable rubber ring which we carried upstream, as we waded through the water, the only dull light coming from our head torches. As we moved upstream we began to see the flickering turquoise lights of the famed glowworms – a strange lavae like creature that glows from a secretion on its backside. We were asked to turn our head torches off and we spent several minutes in the otherwise pitch darkness, marvelling at the magical beauty of these tiny creatures. The light from thousands of individual glowworms resembled stars in a constellation and after a while you eyes adjust to the point you could almost walk by their light alone. After our short break it was time for black water rafting and we climbed into our rubber rings for a high paced journey down stream. The river moved slowly in places but became a full on rapid in others – we spent much of the next hour being spun about, dunked into the water and being bashed against razor sharp rocks. Just when you thought it couldn’t get any more crazy, we abandoned the rubber rings on a beach and began floating down the cave on our back, tossed and pitched, only kept afloat by our life jackets. Several scratches, bruises and deep cuts later and we’d reached the end of our journey. It had certainly been more extreme and intense than I could have imagined. Now frozen cold, it was time to explore the cave, climbing through crevices and over ledges as we headed back up to retrieve our rubber rings. Walking and time out of the water helped us to warm up – aided by a stop for warm juice and chocolate in another Glowworm cave. After enjoying the snack it was time to head home, back to the large open crevice where we’d descended earlier – although it was now 7pm and pitch black outside. The crevice walls were now illuminated by thousands of glowworms which we hadn’t seen in earlier when the daylight drowned out their magnificent colours. What we hadn’t considered was how we’d get back up – but we were soon informed it was a rock climb in the dark up an almost vertical muddy rock wall. One by one we made the terrifying climb – pausing at times to find hand grips to pull ourselves up, while Jamie paused when he discovered a large spider on his hand. Somehow we all made it to the surface in one piece – although it was now 8pm and freezing cold even on the surface. Still wearing our soaking wetsuits we headed back to the base camp for a speed shower, and then to the office for a cup of soup and to view the day’s photos. After saying our goodbyes it was back to the Hippie for our first nights sleep in a campervan – we would certainly be helped by an exhausting day’s adventuring and a few terrible nights sleep before.